As it is the season for romance, it is only fitting that our plant of the month be the rose. 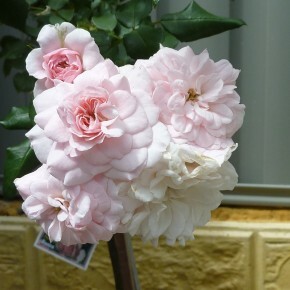 There are many differnt types of roses including: climbing, carpet, minature, standard and the normal garden variety. Roses are quite hardy and can be grown in most soil types.They prefer sunny positions with good airflow to help prevent fungal disesases such as powdery mildew and blackspot. Aphids are the other main pest that you can encounter with your roses. The best time for planting is in June and July and bare rooted roses are the best to plant. This is also the best time of year to provide the winter prune. Throughout the year dead head old flowers and prune the rose again in summer to around one-third of it’s size to encourage another flower display for autumn. Remove any suckers from below the graft line. Ensure your roses are well fertilised, especially during the flowering season as they are gross feeders. Roses can be grown successfully in containers. The rose has been revered as the queen of flowering plants since before Roman times for the extraordinary beauty of their blooms.